Gently purifies and smooth's all types of sensitive skin. The product has agents selected for optimal tolerance and a physiological pH. 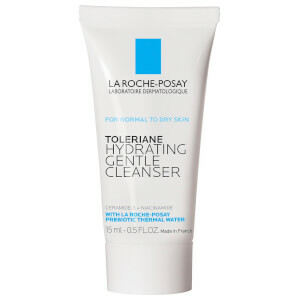 It is also enriched with La Roche-Posay Thermal Spring Water. Impurities and make-up are removed, while leaving the skin feeling smooth and hydrated. Apply to a wet face using a gentle massaging motion, avoiding the eye area. Rinse thoroughly with water. Aqua / Water,Butylene Glycol,Glycerin,Hydroxyethylpiperazine Ethane Sulfonic Acid,Polyethylene,Ammonium Polyacryldimethyltauramide / Ammonium Polyacryloyldimethyl Taurate,Poloxamer 184,Triethanolamine,Tetrasodium EDTA,Xanthan Gum,Solum Diatomeae / Diatomaceous Earth,Polyquaternium-47,Caprylyl Glycol,Myrtrimonium Bromide,Benzoic Acid,Parfum / Fragrance,Sodium Benzoate.